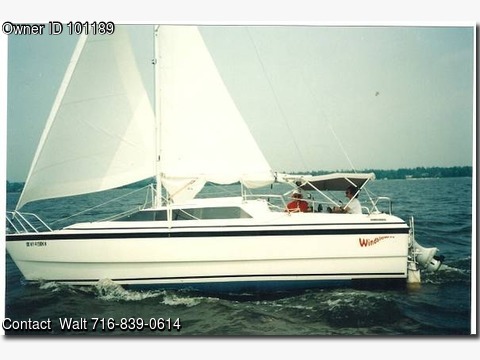 I am selling my boat because my age and medical conditions make it unwise to continue sailing. I have sailed this boat for 18 years and had some of my best memories on it. In addition to day sailing in Buffalo, my wife and I have and taken 2 week cruises in several parts of Canada, Chesapeake Bay, South Carolina, and Kentucky. In all these years it has never let us down. With the 50 HP 2001 Honda Outboard, the 26 will go about 20 mph. It will easily pull a water-skier. This adds one more bit of fun to the boat The boat is in very good condition. It is not a project boat, it is ready to sail now. The weather tight cabin offers full standing headroom, and comfortable accommodations for family cruising. A large double Vberth is forward, with a big overhead foredeck hatch for good ventilation. There is also another double berth aft. The table is large and sturdy, and four people can comfortably have a meal. The sofa seat and dinette seats can be used for conversational seating, or as spare berths. There is a fully enclosed head compartment with porta potty . The galley is on the left. It has a sink with an electric operated faucet, lots of storage space, There is also a single burner stove and a microwave oven. Sails - Cruising Weight North Sails main with 2 reef points, Genoa with roller furling. Cruising spinnaker with containment sock Exterior- all running rigging run back to the cockpit for easy handling. Cockpit has walk thru transom with folding ladder. Full cockpit cushions, Sunbrella bimini, sunbrella cockpit dodger and main sailcover, Fortress anchor with bow roller, Danforth and navy anchor also included. Pedestal table and drink holder. Electrical/Electronics Honda motor has electric start and power trim and tilt. Two dual purpose batteries. 12v and 120v outlets, Compass, Depth sounderfishfinder, GPS chartplotter, Vhf and AM/FM radios.